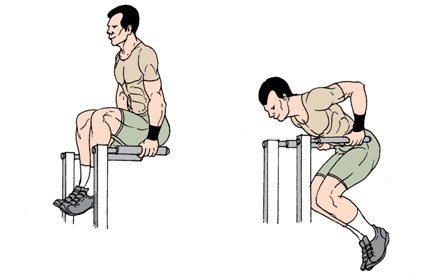 Why is bench dips such an effective exercise? Bench Dips is Dips behind the back to build the triceps muscle mass. This exercise can be done in more than one way. 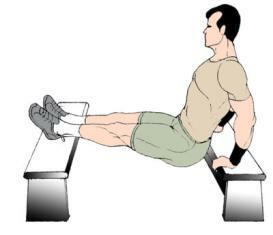 You can do dips with your hands placed between two benches on either side or you can do them like the way illustrated below. 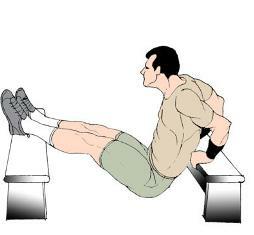 In both these methods you can place your feet on the floor or elevated onto a bench. Check the correct execution technique and get bigger triceps now. 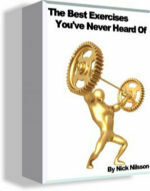 Purpose - To Build muscle mass in the triceps muscle. This exercise is done using 2 benches placed across one another. Hold on to the edge of a bench and let your heels rest on the bench in front of you. Now lower your body while keeping your elbows stationary making your triceps work. From this fully extended position press upwards and get back to start point. Alternatively an easier version is to rest your feet on the floor. 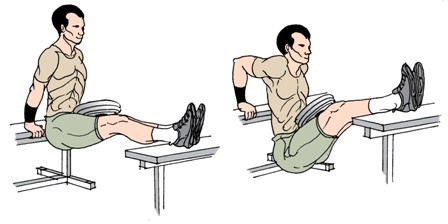 Place a weight on your thighs if you find these bench dips too easy to do. You have seen the parallel bar dips. The Incline version is done on a dip station starting at a point with your thighs parallel to the floor. Lower yourself until your upper arms are parallel to the floor. You can do the incline dips with a weight belt attached. Or try my version. I just put a bag on my back and get going. Killer exercise!! Keep very very strict form and do not lift off the back rather use your biceps only.